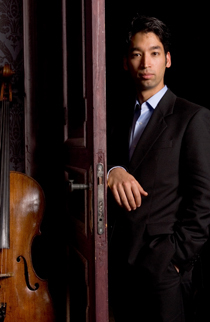 Bernhard Naoki Hedenborg, cello, was born in Salzburg. Having played the Elgar Concerto for Heinrich Schiff at the age of 13 he was immediately invited to work with him for almost ten years. He has also studied with D. Geringas, Z. Nelsova, M. Perenyi, the Alban Berg Quartet and Amadeus Quartet. He has won many national and international competitions, including silver medal at the Tchaikovsky Competition and winner of the European Music Prize of Young Musicians in Oslo. He made his solo debut at the age of 12 with the Mozarteum Orchestra Salzburg and has since appeared as soloist with the Kölner Rundfunkorchester, Prager Symphonie Orchester, Tokyo Metropolitan Orchestra, Yomiuri Nippon Symphony Orchestra, Mozarteum Orchester Salzburg and the Radio Bavaria Chamber Orchestra. In 2003 he toured Japan with the Slovac Philharmonic Orchestra and made his debut at the Golden Hall in the Wiener Musikverein as soloist of the Radio Bavaria Chamber Orchestra.